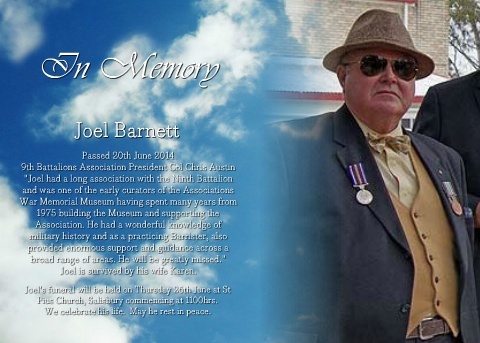 Joel Barnett was for many years an outstanding Curator of the Museum. “My involvement with the Museum started almost by accident. I was about to graduate with my Arts degree. Captain R.A. Hamilton and I had been school boys together at the Brisbane Grammar School and were close friends. Rod being an educator had his own academic gown, hood and trencher and agreed that I could borrow the gear for my graduation ceremony. I picked them up one Saturday from 9 RQR which at that time was at Kelvin Grove (Gona Barracks). On the Tuesday night following the ceremony I returned the gear to Rod. It was a parade night and I was introduced to the 2IC Major Tony Austin who showed me the museum. It was in the Moreton Hall by the sunken road at Gona Barracks. Despite the museum being small, occupying a small room at the northern end of the Moreton Hall, it was an Aladdin’s Cave with a very good embryo collection. I saw two items in the collection which I recognised. There was a practice aerial bomb and a 36 grenade. They had been my dad’s. My dad who at one time had commanded 5th Field Regiment and was actually offered command of 1 RQR, had collected them during World War Two. The story of how he obtained them was interesting but that is another story. In around 1963 he took them up to the army, (after I had been playing ‘Dambusters’ from the top steps with the inert practice bomb). Tony, who had been the first curator of the museum, offered me the curatorship of the museum. My chequered military service had started in QUR but on the first Promotion Course I had an accident. This would give me some active involvement and I have always had an avid interest in naval and military history. I spoke with father and he told me that in the UK, military museums play an important role in unit heritage and esprit de corps. He supported the offer. I agreed and was introduced to the outgoing CO of 9 RQR, Lieutenant Colonel Bruce Peacock, ED who welcomed me. Soon after Lieutenant Colonel Noel Williams became CO. So my career as Honorary Curator would go from 3 July 1975 until when I became Director, with Mal Black succeeding me as Curator. From 2003 onwards I have been a Trustee. I was to liaise with Tony Austin but was left to report to the 9th Battalions Association. The museum had many interesting items, and did reflect the long history of the Ninth. The start date for the collection was the formation of the Spring Hill and Fortitude Valley Rifles in 1867, passing through to the contemporary times, gave a long, valiant and varied military history. Apart from this, 9 RQR preserved the heritage of the second highest award of Battle Honours. Thus the collection could legally encompass Pre-Federation, Post Federation WW1 (9th AIF), post WWI. WWII (9th Moreton and 2/9th AIF) post war 9th Moreton, 1 RQR and 9 RQR. In addition to this the heritage included presence at key battles in Australian Army heritage Gallipoli, Pozieres, Hazebrouck, Bullecourt, Menin Road, Tobruk, El Alamein, Kokoda, Milne Bay amongst many. The disasters of the Great War were particularly sobering and humbling. Men like Bob Horton who was in the 5th Reinforcement at Gallipoli and turned 18 on the battlefield, told me with tears in his eyes of how his mate 18 died from dysentery at Gallipoli, and the butchery at Pozieres. I had read of how Bullecourt was a dreadful advance into German machine guns. The inference had been an ambush. A set of maps was donated by a much decorated Platoon Commander, Ernie Myers (who ended his career as Brigadier in the WW2 Volunteer Defence Force), which clearly showed the machine gun posts on the printed map for the attack ! Another map was donated by Brigadier Eric Martin who commanded 2/9th AIF at Tobruk. The map was printed contemporaneously during the siege and marked to be at particular time and date. Brigadier Martin looked at it and said : ‘The positions were different on that date, that was four days earlier’. That was one of a number of incidents which showed to me how the marked trauma of events of war can be indelible in a serviceman’s mind. A key collection within the museum was 9 RAR’s captured weapons from their tour of duty in South Vietnam. Upon amalgamation the CO, Lieutenant Colonel John Essex-Clarke passed the trophies of war to the museum to hold until 9 RAR was re-raised. Later Brigadier Essex-Clarke toured the museum and said he was happy for them to stay where they were, as they were well cared for and the history acknowledged. Nonetheless there were huge gaps in weapons. After a period of scrounging we acquired more weapons in our own right. Many came from the Queensland Police, as well as lawful purchases we made ourselves. show a close interest in the museum, WO2 Mal Black. Years later after Mal retired, I was very pleased that when my legal practice became busy he was able to take over some of the museum burden by firstly becoming Custodian of Arms, then Assistant Curator and finally Curator. The collection grew and grew. We received relics from Milne Bay, Shaggy Ridge, Benghazi. I was nominated for membership of the Museums Association of Australia by one of the Curators in the Queensland Museum who kept his door always open. One of the things he impressed upon me was that the total collection of exhibits should never be all displayed. Exhibits should ‘rest’ to conserve their life. Space was becoming a problem, but then 9 RQR moved into the depot spaces of 5th Field Regiment RAA when it was amalgamated with 11th Field Regiment RAA and vacated the depot to Annerley. I spent a lot of my childhood up at Kelvin Grove when father had 5th Field Regiment and I put in a bid for the old Sergeants’ Mess. It was almost self contained and had good security, which was later enhanced by an alarm system purchased by the 9th Battalions Association. We stayed there for several years but were moved to a less suitable, but more historical site in the old gun line. The new home had been 105 Field Battery’s Harness Store. It was cockroach infested and we lost some of the spines of historical books. The new museum was fumigated by the Association and the books were rebound. The museum stayed there until the last moves to Enoggera. Throughout my association with the museum we always had 150% support and co-operation from the commanding officers and staff. It played a major role in my life and in the earlier days, then single, took some leave to accompany 9 RQR to annual camps in which I paid for my own rations. very enduring memories of this time is that of Joel punctiliously saluting his father when collected after the Monday parade.